Mera peak climbing nepal - one of the easy trekking peak to climb in everest region- join us! Why travel with us (EBE)? We have the following dates scheduled for this Mera peak climbing trip 2011, that are guaranteed to operate with a minimum of 1 or 2 persons in the group. The Mera peak expedition trip is also available on a private basis to suit your own dates. If you want to travel with your own group, be it family, friends, clubs or old travelling companions,please e-mail us. 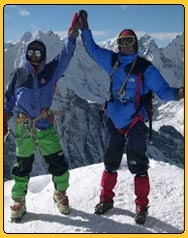 Bookings open for 2010 Mera peak Expeditions, please contact us now! “Mera (Peak) is a chance to venture into a little visited and as yet unspoilt region of Nepal where the hillsides are still densely forested and a need to be self-sufficient is essential. There is also, of course, the pleasure of going above 21,000 feet.” - Billl O’Conner, The Trekking Peaks of Nepal. At 6,400mtr, Mera is officially the highest trekking peak in the Himalayas of Nepal. Rising south of Everest, Mera was first climbed by the now standard route n 1953 by Roberts and Sen Tenging. You will trek through the remote, heavily forested and largely uninhabited Hinku valley. The ascent of Mera is generally technically straightforward, requiring little more then crampons and ice axe. 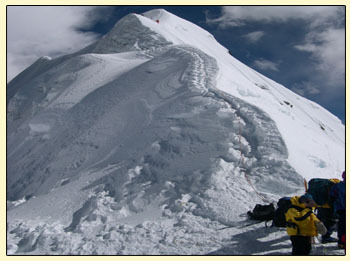 We will fix ropes where necessary and our trained guides and professional Sherpas will assist you as much as possible. After an exciting mountain flight from Kathmandu to Lukla our trek will begin by heading southeast from Lukla. We will walk along a high rocky ridge through dense forests and across several streams before reaching the pass that will take us into the Hinku valley. Trekking and camping in this wild land of Himalayan pine forests is indeed an impressive experience. At Tangnang, we will rest and explore the huge moraine and the beautiful glacial lake north of the village. We will proceed to Khare (5,099m) and establish camp. Our ascent will follow the glacier that leads to Mera – La (5415m) and on to High camp (5800m) where we will prepare for our early morning summit. From high camp, we can take in a sweeping view of Kanchanjunga, Chamlang, Makalu to the east, Everest and Lhotse to the north and Ama Dablam and Cho oyu to the west. This view is undoubtedly one of the most stunning in all of Nepal. With good conditions, we will summit Mera Peak the following morning. We make our way back down the valley to Lukla for our flight back to Kathmandu, you will have completed a demanding trek and achieved the summit of one of the most beautiful mountains in Nepal. By tradition Earthbound Expeditions buys the beers in Kathmandu for you! Mera peak climbing also can be combined with Island peak climbing going over the pass of Amphulapcha and also can include Everest base camp with we have extra days to add and ofcourse more energy and money!! Arrival day, check into hotel and rest. Availability: Every week through out the year how ever (June - Aug) is not recommended. Price: Please ask for the price. Style: Guided trip , camping trek. When is the best season to trek / travel in Nepal? The best season for trek in Nepal is half of February to June and September to early December. We have summer trek to Mustang, Ladakh or Tibet too. Half of February to First week of June: From the half of February until the first part of June temperatures are relatively warm, 10° to 15° warmer than in the fall. Mornings are bright and clear with the air slowly becoming hazier as the day progresses. The rhododendron forests in springtime are spectacular, with color displays that are "Himalayan" in beauty. June is warm and green with many fewer people - the sense of solitude is much greater than other seasons. September to half of December: September to early December is an ideal time for the best mountain views. The days are typically sunny and clear with moderate temperatures and the evenings are usually quite cold. What type of shape do I need to be in for trek in Nepal? Trekking in Nepal is suitable for average people who are moderately fit, thus no previous experience is required. To get condition for the trek, some physical fitness programs such as running, swimming, hiking is recommended before you embark on journey. Person suffering from pre-existing diseases must seek medical advice before considering the trek. Whilst on the trek, it is common to experience some discomfort before being fully acclimatized if you go higher altitude treks.Steps climbing may be involved, although it is never necessary to use ropes. Should I join with group for trek/tour? It is not necessary; you have to join with group and follow our fixed departure date. Private trip is departure everyday upon your request. As these routes in the hills provide special meeting place for the trekkers from throughout the world, traveling in group is not necessary. Rather you can move at your own pace and set your own schedule by not being in group. You can freely alter the routes with in the limits imposed by your trekking permit and your guide will reschedule your itinerary accordingly. But if you are interested to join with group, please choose mentioned departure dates as per your requirement. We will try to arrange group for you. Nepal is absolutely safe country to travel. Earthbound Expeditions take every precaution to ensure the comfort and safety of the trekkers. In regards to political stress, everything has returned to normalcy lately after government - Maoist truce and Maoist party recently joint political mainstream after historical peace accord signed by both parties in NOV. 2006. There is an overwhelming peace & tranquility that prevails throughout Nepal : Come to enjoy ".. a world of it's own". Nepal enjoyed 27.1% growth in Tourists arrival by Air in 2007. Can I get more information about the list of the equipment and altitude sickness? Yes, for the detail information, please contact us. How long have you been in travel and trekking business? Do you have any referral customers? To know more about our services and former clients referral, please browse www.trektibet.com/testimonials_7.html. or write us we will pass their e-mail address to you and you can communicate directly. Read Reviews from Real Travelers!! Trekking Climbing can be extend and there are many options and choices to extend your holiday before or after your main trip. You can even visit to India, Tibet or Bhutan or some Jungle safari in Chitwan national Park, rafting or go to some hill stations to relax or upgrade your hotels for one or 2 nights with Spa or Golf. Contact us for extensions.